Some people shy away from winter sessions because, well, it's cold. But winter sessions make for some prime photo oppertunities, so don't write off the cold months. 1. Keep tracking the weather. Those white winter days after a lot of snowfall can result in some seriously gorgeous photographs. Booking two months out probably won't work, and you'll instead want to book on a shorter notice. 2. Really play up the winter accessories when planning outfits. Think cozy knit scarves, colorful coats, adorable boots, mittens and more. 3. Plan the day out so that nobody gets fussy or too cold. A bribe of hot chocolate after the session goes a long way. Also make sure that everyone's dressed warmly. 4. 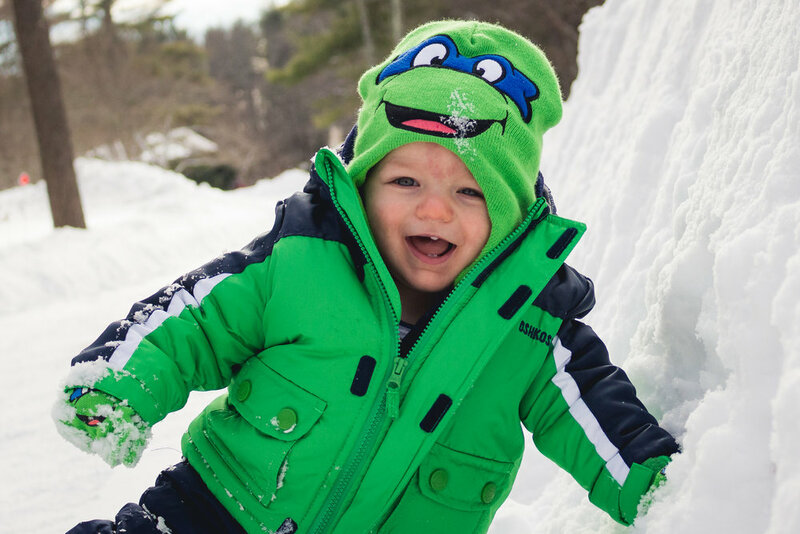 Don't be afraid to have fun in that snow. Snowball fights? Snowman building? Angels? The possibilities are endless and this should be all about having fun. 5. Choose colors and prints that pop. An all white background is absolutely beautiful, but having that pop of red or that flash of gingham can really make for a gorgeous photograph. 6. Pack the necessities. Noses tend to run in the cold, and glasses can fog up. Bring tissues, hand-warming packs, clean clothes and hot beverages to keep everyone perky throughout the shoot. 7. Because it can be really cold, note that a shorter session may be in order. Make the most of your photos by using every single second to the max, especially at the beginning of the session when everyone's still warm and spirits are particularly high. Kids are completely unpredictable. They can be adorable and laughing uncontrollably one minute, and the next minute, turn that charm off completely. They will typically smile for you all day long until you put them in front of a camera, then they freeze up like a deer in headlights. We want to avoid the gritted teeth and bug-eyed forced smiles during our session. Make a list of things that your child thinks are funny and send it to us prior to the session. This way, we can be prepared and add these things into our bag of tricks. Give us a list of icebreakers for your child. Tell us the kinds of shows they watch, music they listen to, friends’ names, favorite story, etc. This will give us something to talk to them about, and will help them forget they’re in front of the camera. Try out a couple of jokes with them. During the session, we can ask them to tell us a joke and this will typically loosen them up as they tell it to us. If there is a song that your child loves, load it up to your phone and bring it along with you, or be prepared to sing it for them during the session. Prepare a bribe (such as a toy, a trip to the zoo, etc.) and show it to them, or remind them of it, during the session. Getting a good smile can help make the session more enjoyable for everyone involved and these simple tips will help that happen. What do you do to get your children to smile? Let me know in the comments! Fall is one of the most popular seasons of the year for portrait sessions. Nature is doing its thing with all those vibrant colors, plus you get a chance to really play up your wardrobe with accessories in the crisp weather. 1. Make use of accessories and clothing that play up the "fall" feeling. For example, leather boots, cable knit scarves and comfy cardigans look amazing on the whole family and can really bring a picture to life. Tip: neutrals do really well in the fall against all that foliage. 2. Timing is everything. Start paying attention to that shift in weather as summer melts into fall. Once the leaves start changing, call us up and book a session. I know that I like to plan fall sessions, so chances are I've got a session ready for you. 3. Location is everything. If it's fall, you better believe we're playing outside in the gorgeous weather. I have a lot of locations to choose from that have particularly pretty backdrops. I'm also open to your suggestions. 4. Plan for a mid-afternoon to early-evening session, when the light is just gorgeous. The days are shorter in the fall, so we need to plan accordingly to get that golden hour light. 5. Play in the environment. Chances are there are leaves on the ground or a few buds lingering around. I may have you throw leaves up into the air or something similar. Remember, this shoot is all about capturing your family bond and having fun, so let loose and get into the season! 6. Pack the necessities. It can get chilly in fall, so you may want to bring some necessities on hand. I recommend a lip balm, moisturizer, warm packs for your hands, tissues, and, of course, warm apparel. 7. Wear comfortable shoes and accessories. Since we're going to be outside, we'll probably do lots of walking. If those boots look amazing, but kill your feet, scratch them. If the scarf looks adorable on Timmy, but it's scratches his face and makes him unhappy, it's better left at home.